he HD WIFI Camera is ideal for Residential, Small to Medium-sized Business (SMB) and SOHO customers for their indoor surveillance security needs. With SeeSaw, remote monitoring your home, loved ones like young kids or elderly parents or pets, valuables, cars, offices, etc becomes very easy, anytime from anywhere on your smart phone. SeeSaw can help you remotely take timely action in-case of any unwarranted event, so you can peacefully work away from home or be away from office. 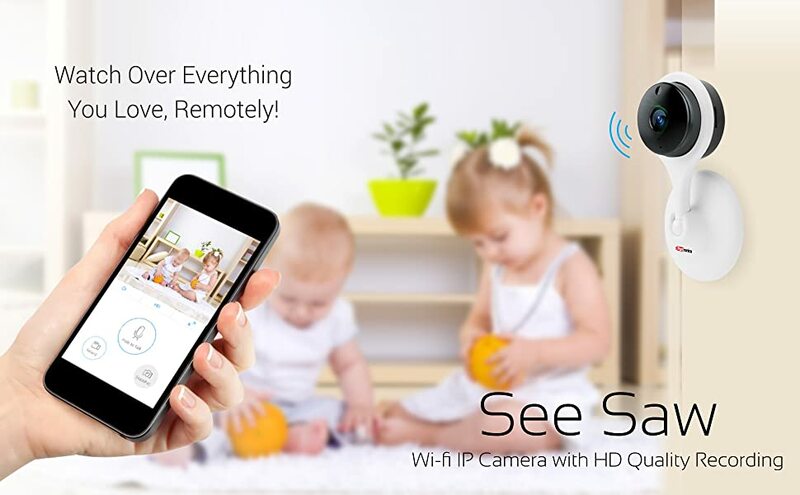 Simply plug & play SeeSaw camera and link it to your smartphone using the free app. Portronics SEESAW addresses your SAFETY & MONITORING needs. It is an extremely useful, affordable, easy to use and attractive wifi HD Camera with Video Storage facility. It also has a two-way audio capability. An easy to use phone app is available for both android and IOS phones. The HD WIFI Camera is ideal for Residential, Small to Medium-sized Business (SMB) and Small Home Office use for the indoor surveillance security needs. With SeeSaw, remote monitoring your home, loved ones like young kids or elderly parents or pets, valuables, cars, offices, etc becomes very easy, anytime from anywhere on your smartphone. SeeSaw can help you remotely take timely action in-case of any unwarranted event, so you can peacefully work away from home or be away from office. A very strong magnet is provided at the base of SEESAW for easy and flexibel mounting. The rotation angle can be flexi-set based on the area you want to observe.